"You've had a telephone message from somebody at Russ Andrews," quoth the medical secretary at a clinic where your old scribe works. "How'd they get this number?" muttered the Old Scribe, wandering off to return the call, forgetting that he'd given it as a daytime number when there was poor network coverage. Russ Andrews have a regular prize draw from those on their mailing list and the Old Scribe had won a Russ Andrews Superclamp Ultra. I've been aware of Russ Andrews' existence since he advertised his shop in the various hi-fi comics of the 1970's and familiar with Russ Andrews' products since he was trading as RATA. This family run mail order business relocated to England's beautiful Lake District, from where they've gone from strength to strength, winning national awards as a model of mail order trading. Russ shares your old scribes' prejudices about loudspeakers with high air volume acceleration and minimising energy storage. Your Old Scribe doesn't share Russ's evangelical enthusiasm for fancy mains wire from wall to hardware as a vital system tuning priority but does agree that good quality mains supply (i.e. clean, low impedance, correct voltage) is a source component. Russ Andrews seems to share Mark Baker's nomenclature inclinations (Origin Live cables and tables were variously graded in a bewildering progression of basic, super, ultra and mega versions) and taken it further with Superclamp, Superclamp Ultra, Megaclamp and Megaclamp Ultra. Further improvements will presumably require coining names like Megasupertetragiclamp Googolplex. The Superclamp is a simple 2 component filter across the 'live' and return side of the 50Hz 230V UK supply. The Megaclamp uses higher grade faster acting components. The 'Ultra' designation, of either, indicates that there are 3 such filters, triangulating live, return and ground terminals in the lightweight plastic plug. The Superclamp Ultra plugs into an unused mains socket adjacent to those where the audio hardware are plugged in. 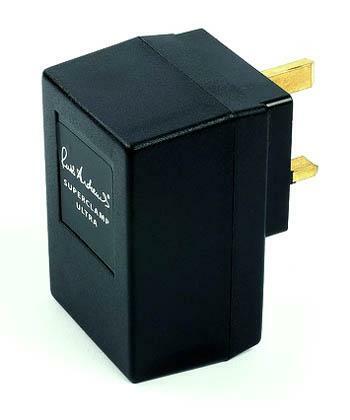 In this instance, this is a home constructed terminal block using metal-clad industrial 13A sockets wired with high current silver-plated multistrand high purity copper cable in a collapsed ring earthed audio circuit with additional low Z earth connection by Radex cable. This mains wiring (described in the articles linked from here) is already optimised by experiment. Old Scribe Towers is in a rural location, a long way (1km) from the substation. This is a mixed blessing as domestic interference is rare but agricultural equipment (much of it within 1.5km) is less effectively silenced electrically. Locally in a nearby village, single cycle spikes of over 500V, above the rated 230V, have been recorded, always on the 'live positive' (a misnomer of convenience) of at least one of the three available phases. Hence your mileage may vary, depending on your local circumstances. Buyers must decide whether 3 legs of Superclamp Ultra (at £57) is as good or better than a single, but allegedly superior, single Megaclamp filter (at £179) between live and return. This may depend on your local wiring arrangements and how high voltage spikes are being generated and transmitted and there is even a Megaclamp Utra at £329GBP. Superclamp variants apparently have a service life of 5 years (presumably depending on how many surges they have to deal with) but Megaclamps apparently outlive their owners. Those with Euro plugs have less options. Some years ago (at an urban location) your old scribe was plagued with noise and interference problems with the Linn Karma moving coil source of an active system with Naim 'K' MC input boards, which had not been a problem with Naim 'S' MC input boards fed by a Linn Asak. Part of the solution to that problem came in the form of a Russ Andrews 'Superclamp kit', comprising 2 unmarked electrical components that were wired across the mains input power supply terminals of the pre-amplifier power supply. Excess voltage affects mains transformer noise, transformer regulation and overloads regulators. Sustained excess voltage should be addressed by the electricity supplier. Brief surges in voltage, whether a half-cycle in duration or more will have similar effects to a degree dependent on the scale of the surges and on the equipment in question. Big, over-specified mains transformers in linear power supplies will be less affected than those built down to a budget. Differently constructed, different types of frame transformers and toroidal transformers will be affected differently. Choice rectification, smoothing and regulation will also influence the effects of mains interference. Remember, your mileage may vary. Every switched mode PSU, every gadget charger and a selection of TV's, satellite box (via filtered multiway block), digital & analogue radios all switched on (volume 0) on other bedroom circuits in the house. Within the house the worst possible interference has been created, but the audio spur is already well protected from it. The audio spur has a low impedance (even at RF) high current ring from its own non-RCD circuit breaker, nearest the incoming supply in the distribution unit. The first few tests indicated no discernible difference between the with and without conditions. Then your old scribe remembered that there is a Russ Andrews Silencer on the kitchen circuit. Removing this and hearing Apostrophe for the third and fourth time in a day confirmed that there was now a modest difference. From the moment the stylus hit Don't Eat The Yellow Snow it seemed to gain impact and downward dynamic range (as Allen Wright would have it). The Russ Andrews Superclamp Ultra sometimes made a slight improvement in this already well optimised set-up. Potential sources of interference have been quieted throughout the house, as close to those sources as possible (thus minimising the potential for the ring mains to compound the problem by radiating it further. More importantly, there are no negative effects from installing the Russ Andrews Superclamp Ultra. Eperience has shown that most filters, decoupling transformers, regenerated mains and other wonder products have some detrimental side effects. While soundstage usually improves, dynamics might be squashed. With most filters, even when dynamics improve, PRaT, Pace, Rhythm and Timing, collapse. The Superclamp Ultra had no detrimental side effects apart from its modest upfront cost. It would be interesting to investigate how much difference the established single pole clamps make compared with the 3 leg Ultra variants. Because the Russ Andrews Superclamp Ultra may be plugged in and unplugged while music is playing, it is easy to make many comparisons on the fly. At electrically quiet times of the day, with everything else optimised, there was no discernible effect. Most effect was noticed between 8AM and 9AM with the other household appliances unfiltered and running. Your mileage may therefore vary considerably. Consciously audible noise seems unaffected but increased dynamic range and enlarged soundstage characterised many comparisons. At worst, the Russ Andrews Superclamp Ultra was inaudible, which is a great result in itself for a mains conditioner. At best it makes a subtle but distinct and consistent difference. There is no substitute for a separate mains circuit for audio systems. As soon as enthusiasts are spending as much on individual components, like amplifiers, as it woulld cost to install an audio mains supply, it tends to become more cost effective than any other upgrade. The Russ Andrews Superclamp Ultra is no substitute for such an arrangement.